For the Birds: Stories about our Fine, Feathered Friends | The Loudest Librarian! 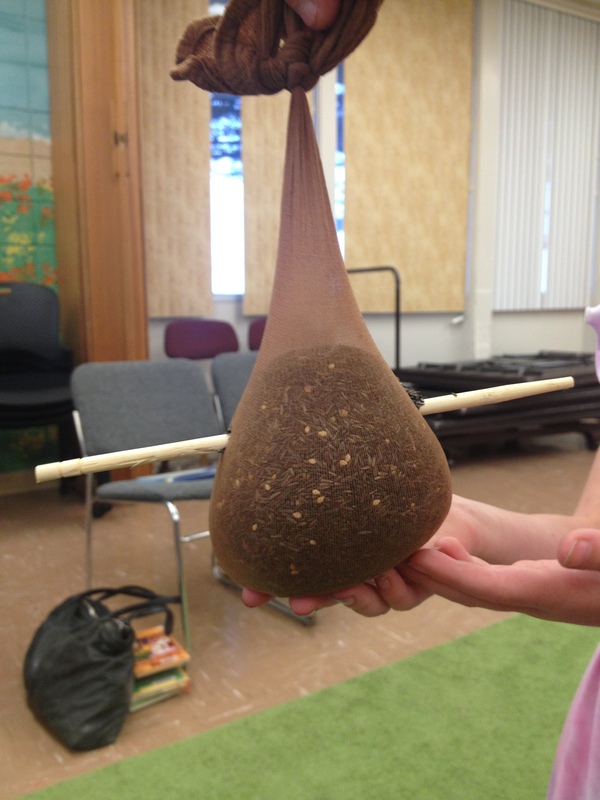 Last night at Family Storytime we read stories about birds, and made a simple bird feeder for goldfinches. This book is perfect for storytime: it has large, colorful illustrations, lots of animal noises, and a funny, annoying repeated phrase the kids get to join in on. A quiet evening at the zoo is interrupted by the newly arrived baby beebee bird, who insists on singing, “Beebee Bobbi Bobbi!” over and over again all night long. The next morning, the other animals are exhausted, the zookeeper is worried, and the lion has a plan to get revenge. I’ve also seen this book performed as a reader’s theater, where it works beautifully because there are so many different parts. One of the kids spotted this Pigeon book in my stack and got really excited. I had actually brought two Pigeon books along, and I asked the kids to vote for the one they wanted to hear: they all asked me to read both. I think this one got the biggest laughs though. 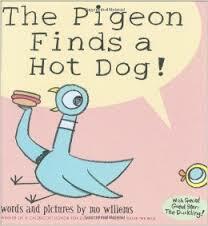 In this book, the Pigeon is about to enjoy the hot dog he found, until an adorable, curious (and deviously clever) duckling asks him what hot dogs are like. 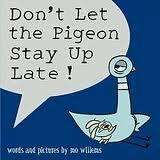 This one is more like the original Pigeon book, Don’t Let the Pigeon Drive the Bus, where the kids get to respond to the Pigeon’s wheedling demands by yelling, “No!” In this case, the Pigeon is angling to stay up past bedtime, by using the arguments and excuses that every parent has heard before. Edward the emu is sick of the zoo. When he hears someone say that the seals are his favorite animal, Edward hops the fence into the seal pool and tries being a seal instead. But then he overhears someone else saying the lions are best, and has to try that too, until another person raves about the snakes. Finally, someone says they like the emus best, but when Edward returns to his old enclosure, he finds a new emu in his place. 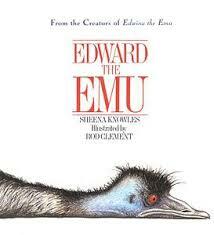 The illustrations in this rhyming story, showing Edward emu-lating the other animals, are hilarious. The kids also enjoyed making animal noises along with Edward. One named Jack, and the other named Jill. Come back, Jack! (Bring the first thumb out in front). Come back, Jill! (Bring the second thumb out in the front). Two little blackbirds sitting in the snow. But the one little duck with the feather on his back. Wibble-wobble, wibble-wobble, to and fro. Wibble-wobble, wibble-wobble, ho hum hum. Fly through my window, my sugar lump! Repeat the verse and chorus, asking kids for the names of different birds (robin, parrot, etc.) to sing in place of “Little Bird” each time. You can also do this song as a dance, where a pair of kids put their hands together over their heads to make a “window” and the other kids “fly” through the window in a line. I found this easy goldfinch feeder on Do-It-Yourself N Save: http://diynsave.com/?p=337. I was really happy, because we get a lot of goldfinches here on the coast, and they are beautiful, and fun to watch. Also, I had originally thought of doing one of the typical kids bird feeder projects, where you put peanut butter on a pine cone and roll it in bird seed, but one of my regular storytime kids has a severe peanut allergy, so this was a much safer alternative. It is super easy to make (although a bit messy, since the thistle seed tends to spill). After showing the kids a picture of a goldfinch, I gave each of them a knee-high stocking or the foot of a regular pair of stockings (one of my coworkers brought me some old ones from her mom, and I had also picked some up at Goodwill). I also had a variety of old jar lids, a chopstick, some yarn, and a bag of thistle (Nyger) seed. The kids each stuffed a lid into the bottom of their stocking, then filled the stocking with thistle seed (I gave them little plastic cups to scoop and pour). Then they tied them shut with the yarn, and stuck the chopstick through the stocking just above the lid. The chopstick makes a hole for the goldfinches to reach the seed, while also giving them a place to perch. One dad wisely waited on sticking the chopstick through the stocking until they got home, to keep the seed from spilling out all over the car (and the library!). All in all, it was easy and fun. 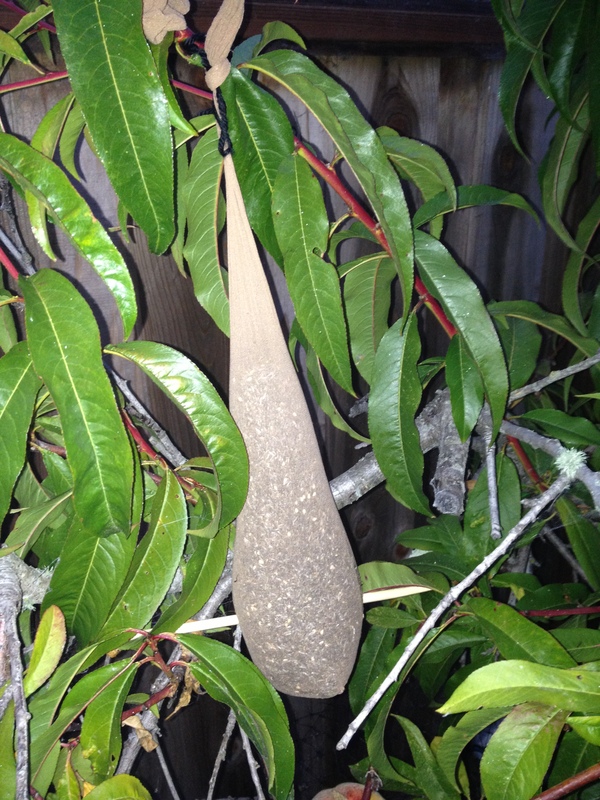 I hung one on a tree in my backyard at home, and I’m eager to see if the goldfinches find it. 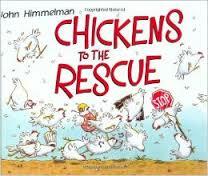 This one is super-quirky, and a little dark, but I love it, and it’s always been a hit at storytime. Ben is frustrated with his new penguin, who refuses to talk. He tries everything from tickling it, to trying to feed it to a passing lion, but the lion eats Ben instead. Luckily, Penguin saves the day, rescuing Ben, and finally speaking, in a language of his own. When Eliot secretly brings a penguin home from the aquarium, his father seems oblivious to all of Eliot’s attempts to make his new pet feel at home, until the surprise at the end. I’ve read this one to a wide range of ages, including a few second grade classes, and they loved it. This has always been one of my favorite books for toddler time. A sweet story about three baby owls whose mother has left them alone in their nest. As time passes, they grow increasingly worried, and wish their mother would come back, and of course, she does. The illustrations are beautiful. I have a personal copy of this book that I’ve read many, many times to my own kids. It is perfect for a snuggly bedtime story. What are your favorite books about birds? Thank you for recording yourself singing the songs with the ukulele! It is so helpful! I’ve been learning the ukulele, myself, to incorporate into my storytimes, and it really helps to hear the songs. 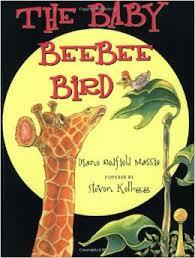 I’ll be using Little Bird for Storytime this Saturday. Thanks, again! Thank you! I’m so glad you find it helpful. The ukulele is such a fun instrument and perfect for storytimes. Let me know if you have any favorite songs that work well–I am always looking for new ideas.